Jack Kelleher is hoping his goals can play a part in Morecambe making a run at the League 2 play-offs. The 18-year-old front man, who penned his first professional contract on Friday, hit the back of the net last season for both the reserves and during a loan spell with Kendal Town in the Evo-Stik First Division North. Now after signing a one-year deal the former Everton youngster is hoping Shrimps boss Jim Bentley will see fit to give him a chance – knowing reserve team football is a lot different to the real thing. Kelleher, who joined the Shrimps’ Lancaster and Morecambe College set-up at 16, said: “If you look at the table we weren’t a long way off the play-offs. “A few more home wins and hopefully we can be there or thereabouts and have a good push next year. “I’m looking to be a part of it whenever the gaffer thinks I’m ready. “I’m trained with the first team and played a lot of reserve team football. “But some of the older lads tell me reserve football is false compared to the first team and playing for three points. 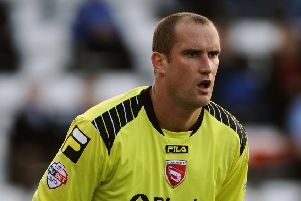 Kelleher, who also spent a year with Stoke City before joining the Shrimps, has however had experience of first team football with Kendal. He said: “It was very tough to start with. The striker thinks he can play a variety of roles up top and now hopes he can go from strength to strength. Kelleher said: “I score a variety of goals. “I’m not one thing. I’m not a target man, I’m not one who just runs in behind, I do a bit of both. “I try and work hard up there.